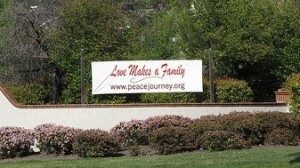 Peace has been a gay friendly church since 1991. Reconciling in Christ (RIC) is our name for affirming LGTBQ participation in all dimensions of congregational life. Peace has publicly advocated for gender equality, the dignity of children and affirmed people of all sexual orientations. All are part of God’s family and all are welcomed here: Gay and straight, bisexual, transgendered, young and seasoned, out or not; Single, married, committed, in love, widowed. 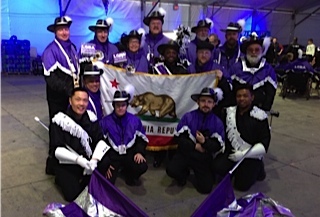 Our Music Director, Gary Sponholtz, is a member of the San Francisco Gay Mens’ Choir and the San Francisco Gay and Lesbian Band. 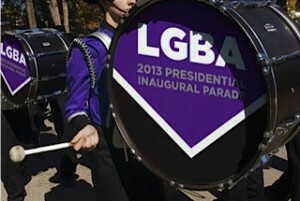 These pictures show the band in Washington, D.C. where they were honored to be in the 2013 Presidential Inaugural Parade. Go Gary! At Peace we walk the talk! Whatever the form – Love Makes a Family! The Reconciling in Christ (“RIC”) Program recognizes those ELCA congregations that welcome believers of all sexual orientations and gender identities. There are now more than 300 congregations, synods and organizations in the ELCA that are on the Reconciling in Christ Roster. Welcome to the household of God! For each is made in the image and imagining of our Creator. God’s grace shapes the space where all are embraced. You will always belong here.